A few weeks ago we were deeply saddened to learn of the sudden passing of long time TJFP grantee and 2016 TJFP grantmaking panelist, Stephanie Mott. I remember the first time I met Stephanie Mott. Soft spoken and kind. At that time she was the first out, trans activist from Topeka, Kansas I had ever met. Like so many trans warriors who organize statewide and in rural communities, she got in her car time after time, traveling mile after mile providing training after training in service of trans justice. Having family roots in the Midwest and also in Kansas, I could envision the flat lands and highways she must have traveled along to make a difference wherever she could. 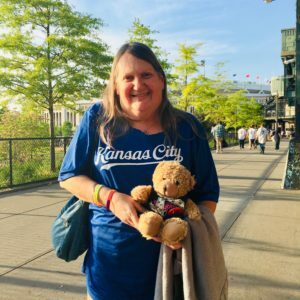 The Kansas Statewide Transgender Education Project (K-STEP), an organization that Stephanie founded and served as the executive director was one of TJFP’s very first grantee’s in 2013. So it was a pleasure to invite Stephanie to be on the other side of our funding project by joining our 2105 community grant making panel. It was there that we were fortunate to get to know her better and learn more about her great love for her community. In addition to being the Executive Director and President of K-STEP, she was also the Founder and Director of the Transgender Faith Tour. She had been a columnist for Liberty Press and a volunteer blogger for Huffington Post. Stephanie published more than 100 articles about being transgender, and as the Executive Director of K-STEP she participated in nearly 400 workshops and presentations related to gender identity in venues from college classrooms and mental health centers, to jails and prisons. Additionally, Stephanie achieved a major accomplishment just last month by earning her certification as a Licensed Clinical Social Worker. She also served as the Vice Chair of Equality Kansas and chaired the LGBTQ caucus of the Kansas Democrats. On behalf of TJFP, we thank you Stephanie for your endless commitment to justice, your tenderness, compassion and generosity, and for finding the activist in yourself. Your impact will continue to be felt and you will live on as our beloved trans ancestor.